The content and the context of this fascinating book by Devdutt Patnaik is pretty much made evident by the title itself. Taken from the vast written and oral traditions in Hinduism, this is an anthology of about a 100 gorgeously illustrated tales related to animals. Leadership coach, consultant and mythologist Devdutt Pattanaik’s work on Indian mythology is fascinating, to say the least. He has endeavoured to make the world of myths and legends from ancient India easily accessible to all. To assist us in our perilous journey through Indian mythology, he has written over 600 articles and 30 books over the past decade. In these books, he has broken down the esoteric and daunting tomes from ancient India into bite sized pieces for easier consumption and then rearranged and reorganised these tales into more logical groups. 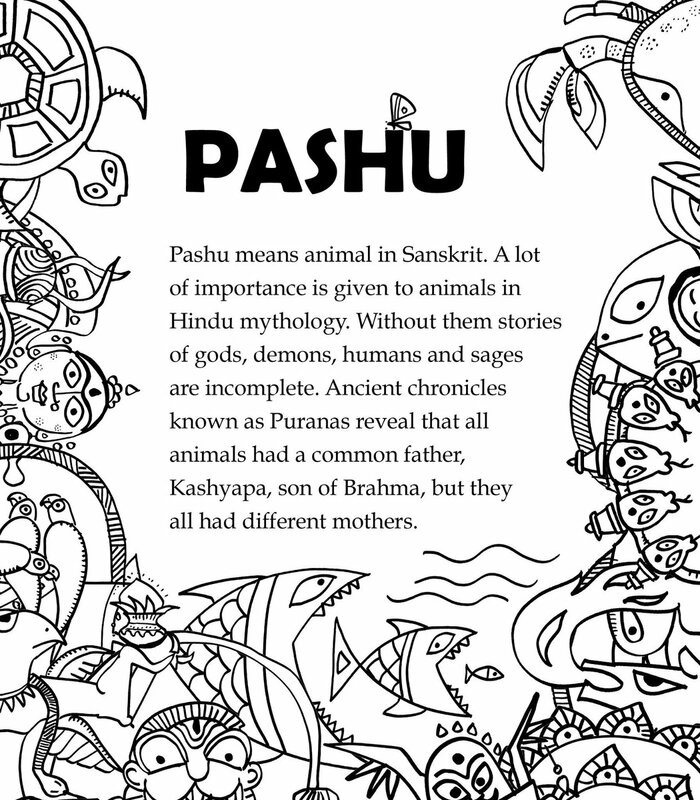 This book, Paashu, is a compilation of animal stories from the Puranas, Ramayana, and Mahabharata as well as stories that are a part of oral tradition and folklore. But there is nothing random about it. The book is divided into 8 sections in which the stories are organized according to the type of animals involved. 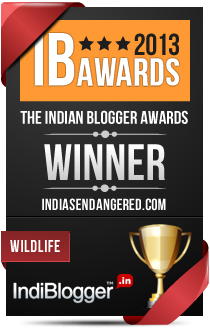 So, there is a dedicated section each for birds, fishes, reptiles, cattle and wild animals. Even the animals who defy classification, the monsters so to speak, find a whole section for their own selves. The last section deals in stories where animals are found in confrontation with the humans. This section is a cheeky little reminder that while we should have compassion for animals, we should not forget that animals are actually ferocious and can be extremely dangerous to human. But it starts at the beginning: At the point of origin of species, at the very birth of all types of animals. The first section of the book is the collection of as many as six legends and myths found within Hinduism related to the origin of various life forms. One myth attributes the creation of species to the ten avatars of Vishnu, another to Brahma who chases Shatrupa as she takes the form of different animals, and yet another attributes the creation to different yoga postures of Shiva. The first myth of creation revolves around Kashayapa, the son of Brahma, also called Prajapati. He had many wives who bore him different types of children. Aditi was the mother of Devas whereas Diti gave birth to Asuras. Timi gave birth to all types of fishes,Vinata gave birth to all birds. Kadru gave birth to Nagas, slithering serpents and worms that crawl. Surabhi is the mother of all gentle animals with hooves whereas Sarama gave birth to all wild and ferocious creatures with claws. Surasa gave birth to animals who defy classification. Evolving from the basic premise that all life forms, though born of different mothers, have a common ancestor, Hindu philosophy clearly advocates Sarva Jeeva Karunya: – All beings deserve our compassion. In fact, the person who loves and protects animals and plants is promised salvation. But, the most important myth of all, from the point of view of the modern day conservationist is the Hindu-Buddhist theory of transmigration, The concept of Yoni asserts that a being gets to live in the human form after passing through 840,000 animal wombs. This not only reiterates the fact that human life is a hard earned treasure which should be spent judiciously, but presents the idea that all forms of life partake equally in the universal life force. Which came first? The yoni of animals or the yoni of humans. Are humans the ancestors of animals or the other way round? There is no escaping the fact that we are related to the birds and beasts of the forest. They may be our ancestors or they may be our descendents. This deep sense of identification manifests in an abiding sacredness of animals where they have come to be an integral to the iconography. Some Animals like the Sacred Cow, are revered as deities in their own rights whereas others became the mounts of various Gods, symbolizing or complementing the energy or character of the deity. So, we find that Shani, the God of planet Saturn, Lord of Time, rides a vulture that is extremely patient and eats the dead. Mangal, associated with war and aggression is depicted seated on a lion. This book is intended for the kids, who, without any doubt, are going to lap up these fascination stories about horses that fly, and monkeys that build bridges, and beautiful queen who is actually a frog!!!. The line drawings and illustrations done by Patnaik himself in his simplistic and minimalistic style are used as the extension of the narrative by providing a quick visual interpretation of the written word. I would highly recommend this book for anyone interesting in Indian mythology. But for kids, I would recommend this book not only as a story book but as a conversation starter between parents and/or teachers and kids. The sublime and abstract philosophical ideas and ideals of Hinduism are taken straight to the heart. The kids can grasp the subtle philosophical truths through instructive stories and illuminating discourses. So, go right ahead. Get acquainted with intriguing creatures like Ucchaishrava, the flying horse, Airavata the elephant with seven trunks and six tusks and Panchajanya, the demon in the shape of the shell fish whose body became Krishna’s trumpet. Find out how Garuda earned the honour of not only being Vishnu’s Vahana but also got emblazoned on his flag. Publisher – Penguins Books Ltd. The views expressed on this page are solely the reviewers’ and do not reflect those of various publishers, authors, publicists or agents. 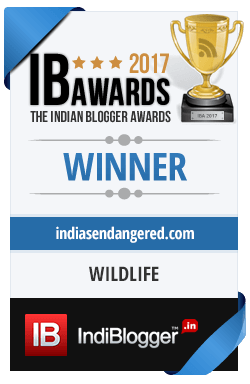 The book featured here was purchased by India’s Endangered for honest and independent review purpose only and is not part of any association with the author or publisher.